The Arab World is experiencing an unprecedented moment of constitutional transition. Many countries in the region are reforming their systems of constitutional judicial review as a way of signalling the government’s commitment to the rule of law. This includes establishing constitutional courts, a body with exclusive jurisdiction over constitutional judicial review. This report investigates how constitutional court appointment-procedures can be designed to promote both judicial independence and judicial accountability to a democratically elected government. It analyses four models and examines how the models have been applied in six countries: Egypt, Germany, Iraq, Italy, South Africa and Turkey. The report also presents a comparison of the qualifications required for appointment to the constitutional court, and the rules for removing constitutional court judges. 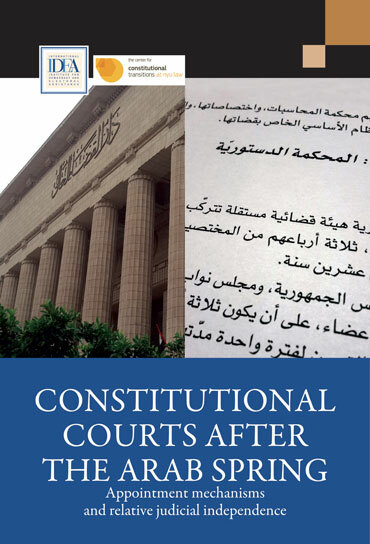 The report is part of a series of on issues in constitutional design that have arisen in the Arab region published by the Center for Constitutional Transitions at New York University Law and the International IDEA. These reports are designed for use in support of constitution-building activities in the Arab world. Third Annual Melbourne Forum participants from all over Asia and the Pacific gather to share regional insights on constitution-building. Image credit: Melbourne Forum on Constitution-Building. Minister for Foreign Affairs of Nepal, Hon Pradeed Kumar Gyawali, with Leena Rikkilä Tamang. Photo credit: International IDEA.